Merge Catalan cookery and Barcelona’s vibe during an evening walking trip in Barcelona. Get a synopsis of Las Ramblas, the most renowned street of the metropolis, and stopover at the ... morefamous market La Boqueria, just before discovering charming restaurants and cafes in the city. Later enjoy a walk in the fantastic Raval locality and the active Poble Sec area to a part of the pleasant ambiance. 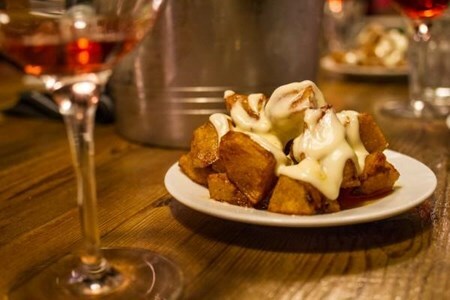 Mingle with people who go out for tapas after work, arousing the nightlife. You will feel like staying in Barcelona and enjoy its cadence ceaselessly after your Tapas evening walking tour in Barcelona. Discover the secrets of the famous tapas (also for vegetarians) in a casual banquet. Various flavors will shape a tasty meal in addition to a mouth-watering experience in trendy and unique tapas bars. Thanks for the correct suggestions and explanations from your friendly gourmet guide, the meaning of pincho, montadito, vermut, pa amb tomàque and porró will be apparent after the trip. 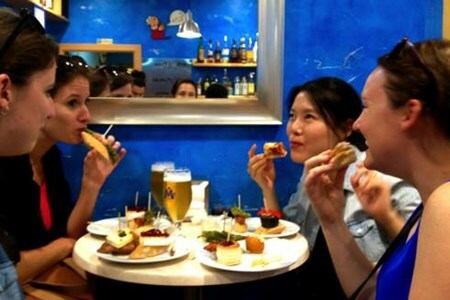 When you go back home, you will be able to invite your relatives and acquaintances while recalling the Tapas evening walking tour in Barcelona. Montserrat is the first stop, the residence of Our Lady of Montserrat, normally acknowledged as La Moreneta (the Dark One) owing to the dark shade of the statue. 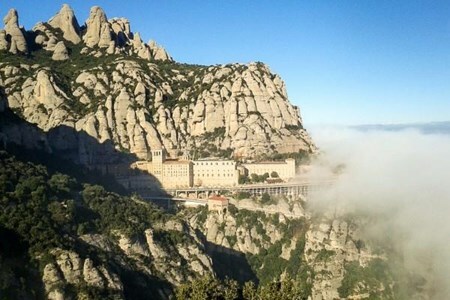 During Montserrat ... morewalking, your guide will inform you exciting facts about the area and why the rocky mountain and its beautiful monastery have been amongst Spain’s most significant pilgrimage spots ever since the 12th century. We will use the cable car and see the refuge from above, which has been around for 1000 years for pilgrims, who have climbed this impressive mountain. Discover the superb mountains of the Natural Park and enjoy the picturesque views. Go on with a tour of the Museum of Montserrat (own cost) and Royal Basilica and to study about Montserrat’s religious and cultural significance and see work of art from Picasso, Monet, and Dalí. 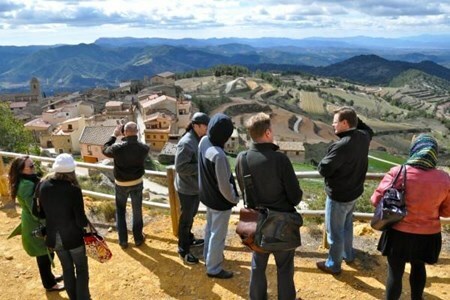 Afterward, rest with your group to enjoy a three-course traditional Catalan lunch of nearby grown products from a 16th-century farm, which were previously owned by Montserrat monastery’s monks. Delight in the lovely taste of local Catalan cookery next to the astonishing Mountain of Montserrat. 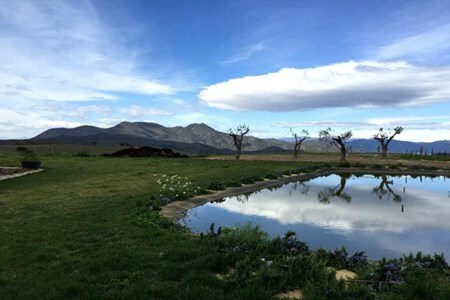 Later, you will have the likelihood to visit the farm’s olive oil mill and visit the property at your leisure time. Enjoy the excellent taste of local Catalan gastronomy, while sharing stories of your memorable walk along Montserrat and its fables. Before going backing to Barcelona, tour Penedès the headquarters of Cava (Catalan champagne). Stopover at a neighborhood winery and find out how the famed wine and cava are made, from the first grapes pressing to the fermentation in the massive span of cellars. Accompany this with a tasting session to perceive precisely why they have obtained such worldwide fame. We welcome you for a private tour to one among rare wineries that is Paraje Qualificado certified, Denomination of Origin Alella. You will get a chance to enjoy iconic tapas lunch ... moredesigned for a pair while you sample 6 exceptional award-winning organic wines as you gaze at the best views of the Mediterranean Sea. This pioneering, original, family run wine cellar is only 30 minutes away from Barcelona and has elegant surroundings that overlook the Mediterranean Sea. You will stroll around the vineyards and tour its barrel areas designed inside the rock for natural preservation as well to maintain original topography. This wine cellar is the most compact among Catalan Denominations of origin yet it produces a wide variety of elegant, high-quality wines. Some of its wines are available in most of the leading restaurants in the world like the Michelin Star restaurants. We welcome you to a wine, art and Dali experience where you get to travel close to the border with France. You will visit the Dali museum located in Figures, where you explore the ... moreworld of the eccentric Salvador Dali, who designed and built this unique building. This museum holds impressive pieces of art that include drawings, paintings, jewelry and furniture. You will after that visit a selected wine cellar for relaxing settings, excellent wines and innovative philosophies, as you walk through the vineyards while you enjoy the scenery of the hills afar. Also included is the signature Spanish tapas with wine. 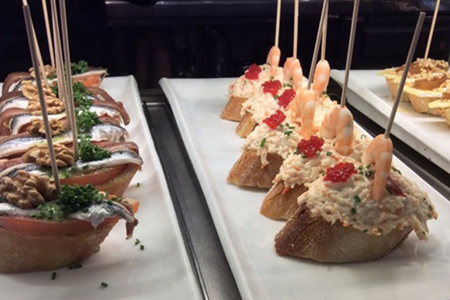 Enjoy a unique gastronomic trip to Barcelona’s best tapas destinations. We will experience the Catalan gastronomy with remarkable tapas tasting schedule. We begin by visiting ... moresome tapas places at the Boqueria marketplace where we'll taste some of the best delicacies paired with excellent local wines, cava or beer. We will visit the oldest and best marketplace in Europe after having had some delicious baby squid with beans and fresh oysters. After a short 5 minutes walk, we relish in a plate of the most exquisite acorn-fed cured ham with tomato bread next to a mouthwatering grilled pork loin on a slate board or a bunch of steamed mussels. After tasting the unforgettable txistorra red sausage and some mushroom croquettes in a Basque taverna, another short stroll will take you where you will have an enticing garlic shrimp cassoulet that will follow some tasty fried sweet green peppers. A tiny, almost hidden spot will surprise us with their best seafood delicacies, amog which the exotic mediterranean sea urchins. Lastly, we indulge ourselves at two excellent bars: one has been in business since the 1920s and offers a large variety of small delicious local plates, even cockles or land snails, while the other opposite the lane offers quality, more mothern Catalan snacks that include from fideuà noodles or black rice to stuffed accordeon squid or batter fried baby fish. When in season, the fried flakes of artichokes, the rovellons wild mushrooms or the calçots young grilled onions can also be enjoyed in the tour as traditional classical specialties. On this Penedès winery tour, visit one of the largest traditional cava cellars and a unique upscale wine cellar in Penedès County. Explore the astonishing findings of the Cava and ... morewine elaboration secrets. This tour is open to family groups and children are allowed especially in the vast cellars such as Codorniu, which provide little train trips around the premises. Excellent wine tasting is also included in the tour. The most extensive cellars, Codorniu for Cava, in Sant Sadurní d’Anoia: started in 1551 and one of the world’s biggest sparkling wine companies, it features a luxurious art nouveau winery complex and residence, with endless old cellars and tunnels, carved by hand with a depth of more than 60 feet and incredibly massive in size, storing some 100 million bottles. On this Penedès winery tour, visit one of the largest traditional cava cellars in Penedès County. Explore the astonishing findings of the Cava and wine elaboration secrets. This tour is open to family groups and children are allowed especially in the vast cellars of Codorniu, which provide little train trips around the premises. An excellent cava tasting is also included in the tour. The extensive Codorniu Cava cellars, in Sant Sadurní d’Anoia, started the wine production in 1551. 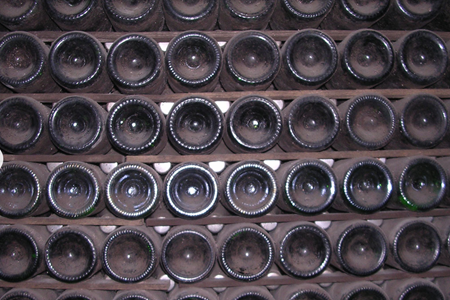 A cava producer since 1872, it became one of the world’s biggest sparkling wine companies. It features a luxurious art nouveau winery complex and residence, with endless old cellars and tunnels, carved by hand with a depth of more than 60 feet and incredibly massive in size, storing some 100 million bottles. The smaller, family-owned winery with very good wine cellars: ideal for enthusiasts. A wonderfull wine estate dating back to 1668, it encompasses the pride of the roots in the terroir, the vines that give them their personality, with the search for excellence in a very stylish and modern upscale approach, ageing their wine in pottery anforae. 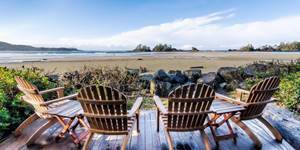 Tour the estate in an off-road convertible vehicle, accompanied by a wine-grower. 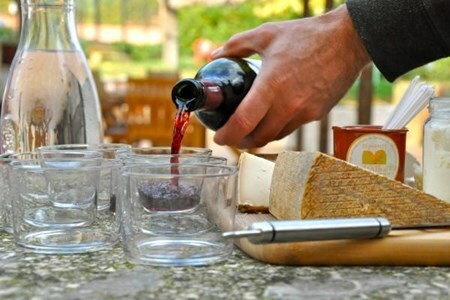 End the tour with a guided tasting of their wines with some select aperitifs. We welcome you to the Denomination of Origin Penedès wine and cava region famous for its effervescent cava production and comprehensive collection of still wines. You will visit three ... moreseparate and very distinct wine cellars starting with an exquisite and striking cava cellar situated on the outskirts of Sant Sadurni d´Anoia, the Cava making hub, for a chance to taste three cavas. 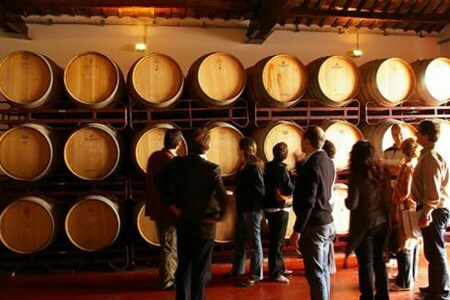 Your second tour is at a glass covered contemporary design wine cellar for the best views of the Penedès` plain; you will get a chance to visit their wooden barrel area and taste three wines that include reds and white which are vi de Finca certified. Your third tour is to the first wine cellar ever to produce organic wine in Spain. 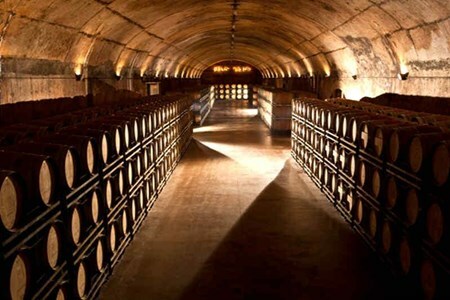 It is a famous wine cellar due to its original spirit and is located in a pleasant rural Finca. You will get a chance to taste three multiple-award winning natural wines, as you enjoy its setting and scenery of the countryside and vineyards nearby. You will get a chance to experience a full three-course Catalan lunch that includes wine at a local establishment, operated by generations of the same family. It will be a whole day away, with several glasses of wine and we, therefore, recommend our clients to have a substantial breakfast before pick up. We welcome you to a unique combination of exclusive wine tasting and sailing experience in the Costa Brava, the Mediterranean Sea on board our private yacht that departs from Llanca. ... moreIt is an exclusive wine tasting day tour where you get a chance to taste elegant Catalan wine and Cava as you sail with striking views of the coast and beyond. 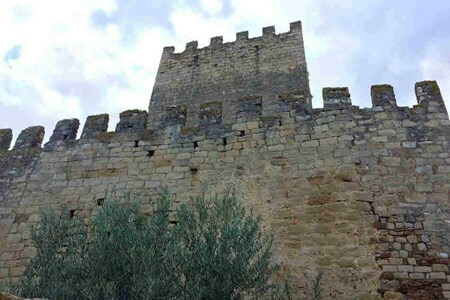 The tour is a 2-hour drive to the North of Barcelona on your way to Girona to the Perelada Castle. It is a place rich in history and tradition which is still owned by the Counts of Perelada and is one of the most reputable Spanish wineries. This cellar has several international prizes under its name and has become a cultural centre frequented by international artists for open-air shows. It is a land of contrasts excellently sandwiched in the Catalan Pyrenees and located only 16 miles from the Mediterranean Sea and the French border. This Denomination of Origin is the most ancient wine producing region of Spain and is named Empordà´s with its microclimate which benefits from mild winters and harsh summers. The micro-climate is a perfect mix to deliver remarkable grape quality reflected in the quality of its wine. 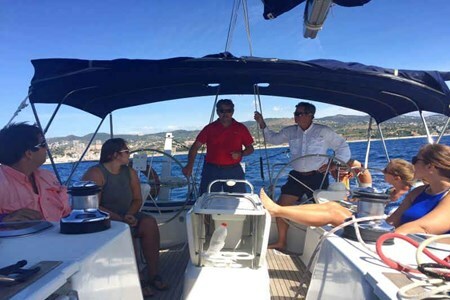 Upon arrival at the Peralada Castle, you will head to the village of Llançà by the sea where you step on board our boat for a 3-hours sailing voyage, by the vineyards of Finca Garbet. 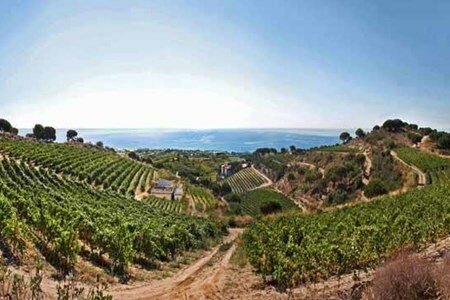 It is the only Catalan wine cellar with vineyards next to the sea. These vineyards grow local grape varieties like the Macabeu and Xarello, as well as exotic grapes like the Gewurztraminer, Sauvignon Blanc and Chardonnay. Red wines are made from Carinyena and Cabernet Sauvignon, Merlot and Syrah one of our local favorites. Also included is Catalan lunch. 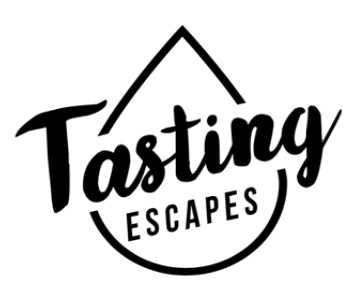 We welcome you to a cava sampling exercise where you will get a chance to visit two of the most favorite effervescent cava and wine cellars and tour the Sitges in the birthplace and ... morehome country of Cava along the sea. You will get an opportunity to explore this town's beautiful promenade and have a Catalan made lunch in a local restaurant. You will genuinely explore the Denomination of Origin Penedès wine and Cava region as you enjoy its green landscape where close to half of the area is under vineyard cover. The three most native grapes used when making cava are regional varieties: Macabeau, Perellada, and Xareló. You will visit two different wine and cava cellars where the first visit takes you to an exquisite and modern award-winning cava cellar, with its state of the art tasting room and barrel area. The second visit is to the Cathedral of cava located on the outskirts of Sant Sadurni d´Anoia, the Cava making hub. It is a captivating building designed and built by a famous Catalan architect, Josep Puig i Cadafalch, and it is a real architectonic gem of the Catalan Modernism. You will have a full three course Catalan lunch which includes wine at a local establishment, operated by generations of the same family. 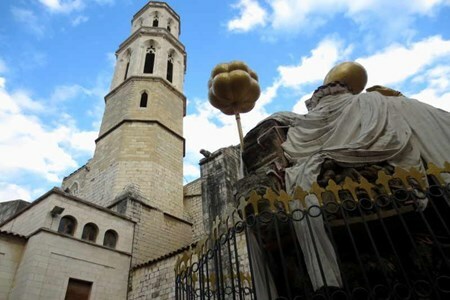 Afterwards, you will visit Sitges, a town renowned for its architects, painters, intellectuals, and sculptors from across the globe and is also famous for its carnival, film festival, and the vast and long seaside promenade. The weather is good, as Sitges enjoys 300 days of sunshine on average every year. We welcome you to the beautiful Costa Brava with its charming Medieval villages of the Empordà wine region. These villages are built with native sand colors stone, which dates back ... moreto the Bronze Age, you will visit a castle built in 1000 AD and the adorable Saint Stephen Romanesque church which dates back to the 13th Century, all made in an undulating countryside. 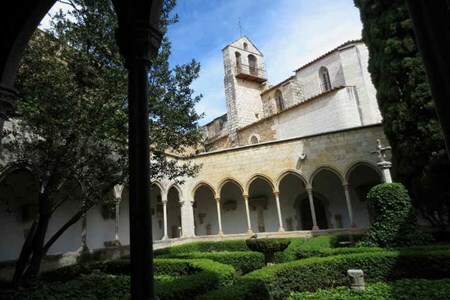 This is a guided tour, and you will be provided with a professional historian to help you discover the hidden treasures of Palau Sator, Sant Julià de Boada and Peratallada, as you enjoy exclusive VIP access. You will have signature Spanish tapas for lunch with wine at a local bistro at the core of Peratallada. We welcome you to a 2-hour drive North of Barcelona for a wine tasting tour at a wine cellar situated high on the Cap de Creus Natural Park, selected for its views of Costa Brava. 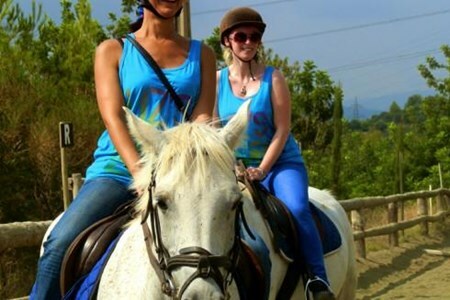 ... moreYou will take a walk on its grounds as you taste its wines which are some of the best in Catalonia. This family-run wine cellar is located only 16 miles from the French border and enjoys a microclimate composed of mild winters and harsh summers, providing a perfect combination ideal for the production of high quality grapes. You will visit the romantic Mediterranean Sea town of Cadaques for lunch. This famous town was a darling to legendary artists like; Walt Disney, Salvador Dalí, Joan Miró, René Magritte, Pablo Picasso, and Terence Weil. Gabriel García Marquez also mentioned Cadaques in his book, Tramuntana, following the severe and prevailing strong wind experienced in the area. This tour is a day trip that gives you a chance to mix several excellent wines, enjoy unrivalled views, while you visit the famous and exceptional seaside town of Cadaques. 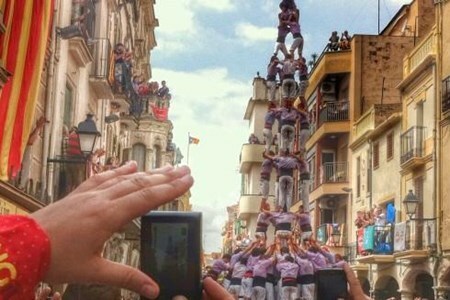 Find local tasting tours & activities in Barcelona, Catalonia, Spain. Sort by location, theme, tasting, activity, day, duration, price etc.